A traditional black powder hunt is a unique experience. Armed with a proper mindset and outfitted in authentic garb, each participant travels back in time to his or her chosen historical era in search of meaning to “What was it really like…?” Where else can a person find such great fun? Each of us possesses a set of God-given talents. Oftentimes we fail to realize the extent of our ability or fully develop a skill’s potential. Sometimes a project’s requirements simply exceed our own talents, but in most cases, backcountry skills are rudimentary and easy to master. The lessons garnered from hand-sewing a linen shirt, for example, rival those learned in the heat of a fair-chase pursuit. The personal satisfaction gained from crafting a neck scarf, a pair of buckskin leggins or a leather sheath for a newly-acquired butcher knife is unmatched. In addition, wearing the clothing or using the tools of the hunter’s trade, handmade in the same manner as the originals, enhances the overall historical impression and increases the traditionalist’s ability to shed time’s shackles. 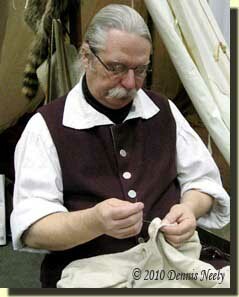 This site’s “how-to” pages are meant to assist in simulating an authentic and meaningful portrayal by addressing the traditional hunter’s “material culture.” Step-by-step instructions and accompanying images will outline the construction of a given garment or accoutrement, illustrating one possible method to re-create a period-correct artifact. The instructions are offered as a guide only, covering a wide range of projects, as time permits.